Introduced in 2010, the 56-quarter series celebrates national parks and sites throughout the 50 states, the District of Columbia and the 5 U.S. territories. 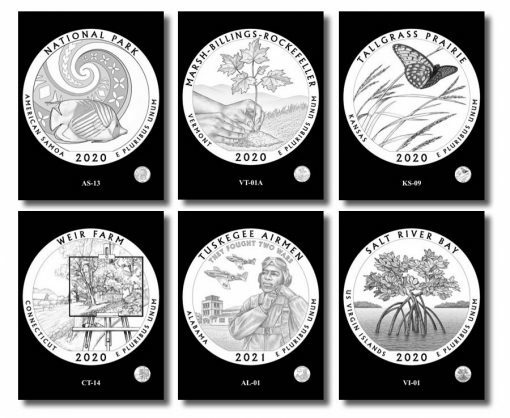 In total, sixty-three design candidates were unveiled for the series final six quarters. The Citizens Coinage Advisory Committee (CCAC) reviewed each of them on June 12. 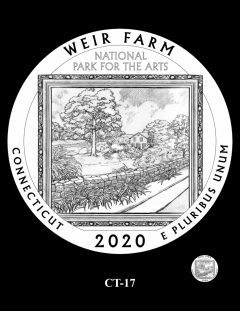 The Commission of Fine Arts (CFA) will offer their recommendations on June 21. 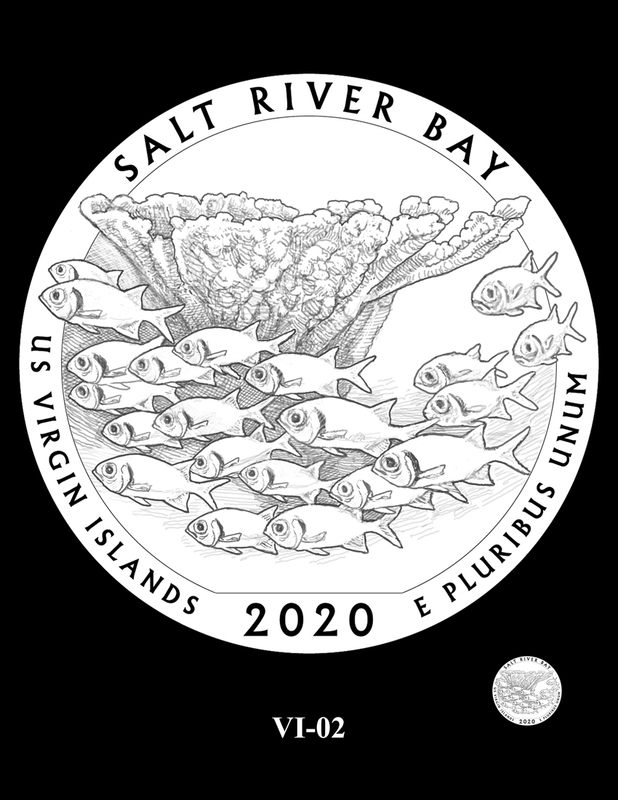 The Treasury Secretary is tasked with selecting final designs after receiving recommendations from the CFA, CCAC, U.S. Mint and national site liaisons. CoinNews will present CCAC and CFA selections together in an article after the 21st. AS-03 depicts a divided-view, with the top half of the design featuring the northern tip of the park looking east, with Pola Island to the left. Beneath the wave element is a seascape of a coral reef, characteristic of the Indo-Pacific reefs found at the Park. The design symbolizes the goal of preserving American Samoa’s entire "sacred earth" ecosystem, including those systems less apparent to the naked eye. 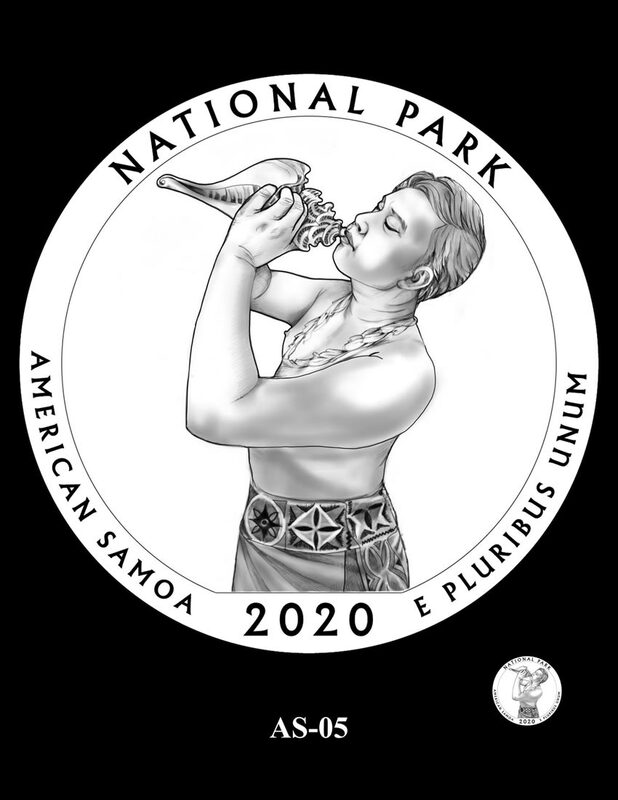 AS-04 and AS-05 portray a Samoan man blowing on a conch shell during special ceremonies and indicating curfew in the village. Design 04 also features a scene of American Samoa’s shoreline. 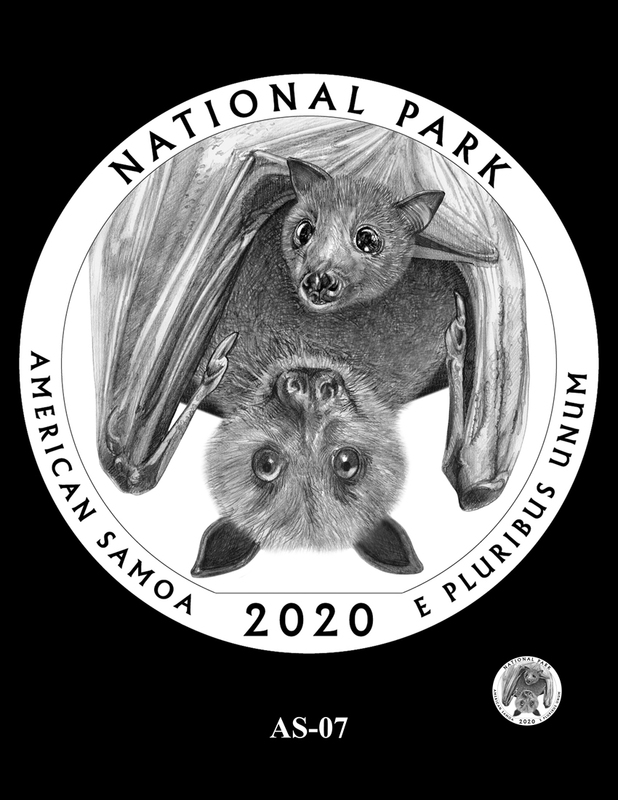 AS-07 depicts a Samoan Fruit Bat mother hanging in a tree with her pup. The image evokes the remarkable care and energy that this species puts into their offspring. 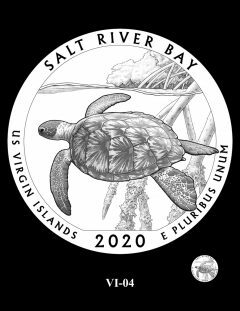 The design is intended to promote awareness to the species’ threatened status due to habitat loss and commercial hunting. The National Park of American Samoa is the only park in the United States that the Samoan Fruit Bat calls home. AS-08 portrays a man blowing into a conch shell, which is a ritual often used to signify important cultural and religious ceremonies. Since it is also used to communicate across the waters, a coin with this design can be seen as a global invitation to visit the National Park of American Samoa. AS-09 highlights the Samoan Fruit Bat, native to American Samoa. 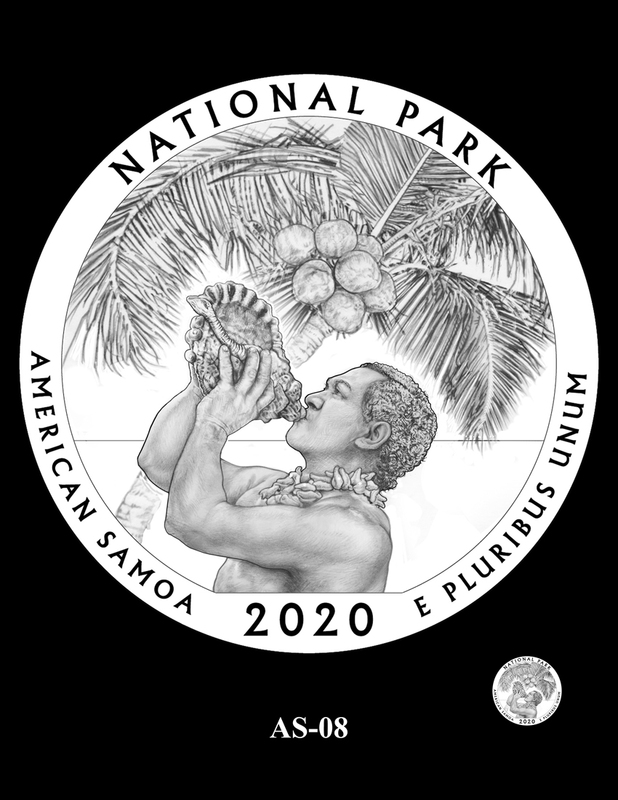 American Samoa is the only American locale where this unique animal, a significant mythological symbol of the ancient Samoan culture, lives. 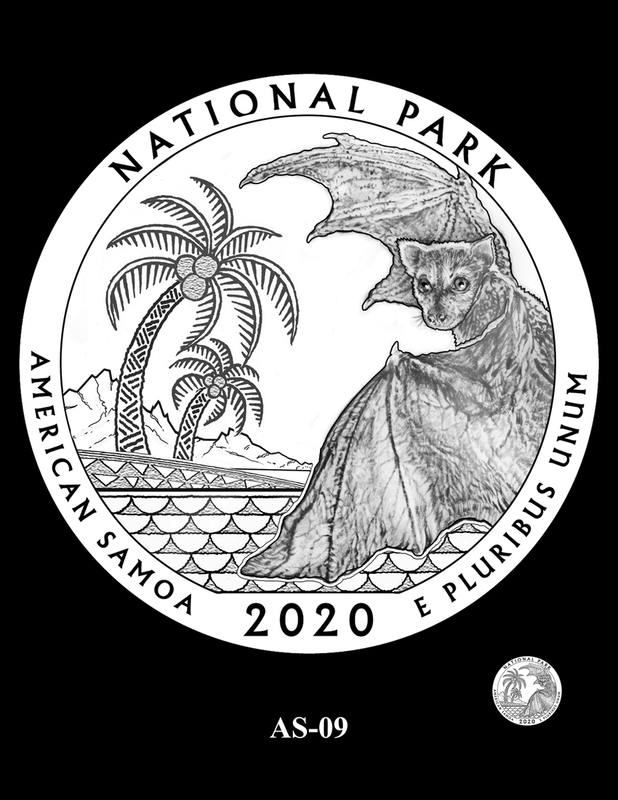 The bat is artistically juxtaposed with a stylized scene of a Samoan seashore. 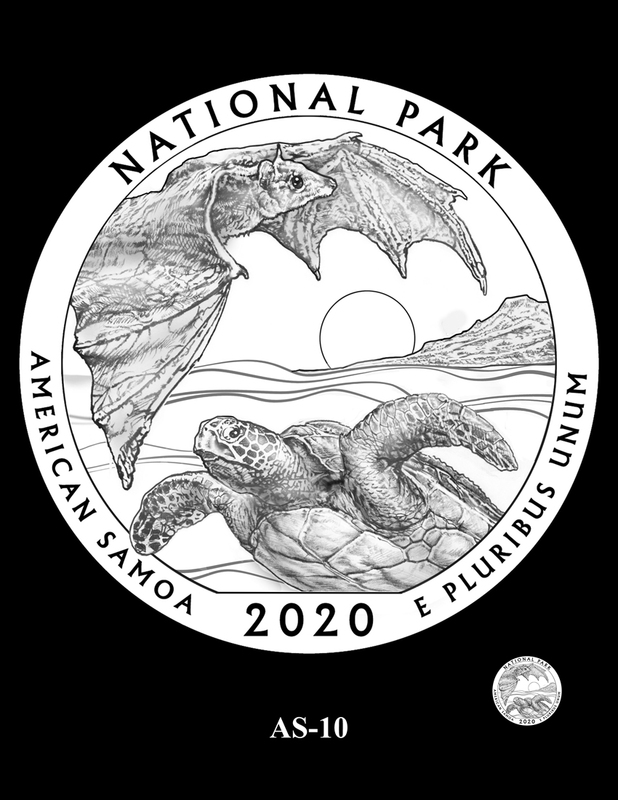 AS-10 features both the Samoan Fruit Bat and the Green Sea Turtle with the island of Samoa in the background. Both creatures are native to the island and are significant mythological symbols of the ancient Samoan culture. AS-12 depicts the Samoan Fruit Bat among plants important to the Samoan people as part of their staple diet: coconut, breadfruit, and taro. AS-13 portrays a Threadfin Butterflyfish – a tropical fish common to American Samoa, and the reefs around the National Park of American Samoa. The design in the background is a Polynesian symbol of a wave, common to the Samoan tradition of Tatoo within the wave design. CCAC: The above design, AS-13, was recommended. 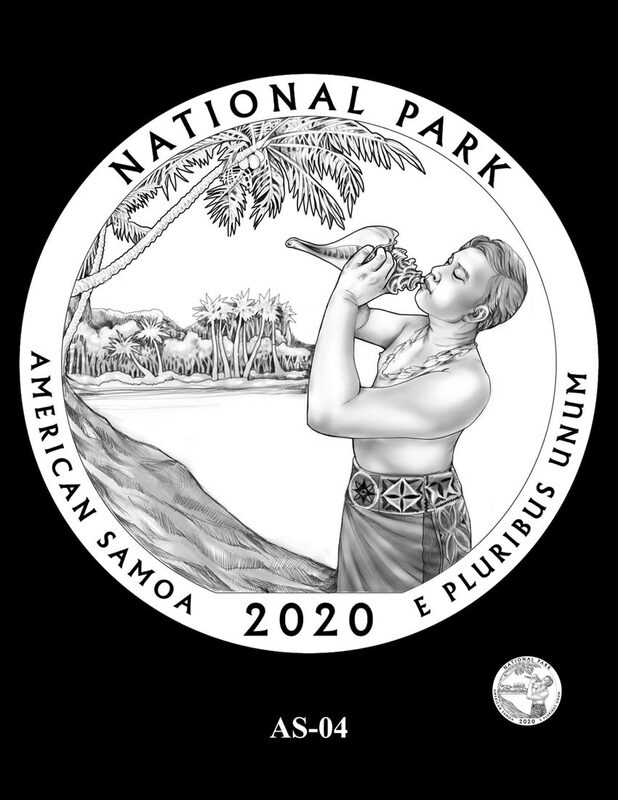 AS-14 depicts a scene of the Ofu unit within the National Park of American Samoa, with the spectacular ancient volcanic mountains rising on the island. In the foreground is a reef with several Threadfin Butterflyfish and a variety of other sea life. CT-01 displays a French easel near a stone wall in front of Weir House. CT-03 and CT-03A celebrate the tradition of American Impressionist painting by featuring an "en plein air" artist’s palette and brushes in front of an iconic stone wall with the site’s trees in the background. Design 03 also features the artist’s canvas on an easel. CT-04 features J. Alden Weir’s studio, which is beautifully preserved to commemorate his art and legacy. In the foreground is Weir’s daughter Dorothy’s tool shed. CT-05 depicts the hand of an artist creating a painting with Weir Farm in the background. 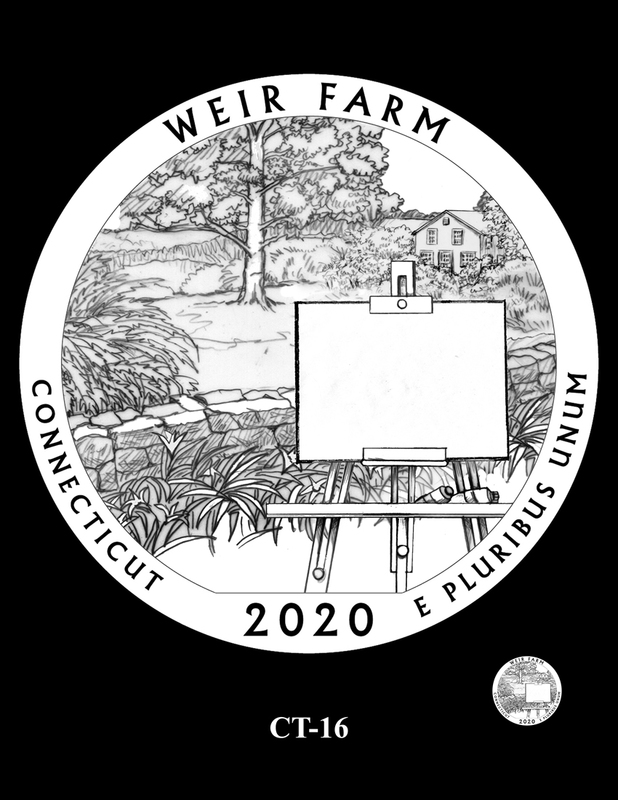 CT-06 portrays J. Alden Weir painting outside his studio at Weir Farm. It is inspired by various images of the studio and his paintings created on the property, as well as descriptions of Weir and his fellow artists absorbing creative and aesthetic inspiration from the rural environment. The design allows the viewer to feel as if he or she is standing where Weir stood. The inscription "National Park for the Arts" is included. CT-10 highlights a painting being created, from the artist’s point of view. The palette and hand with brush are symbols of the work and enjoyment of painting "en plein air." The inscription "National Park for the Arts" is included. CT-11 shows a painting being created, from the artist’s point of view, of the Burlingham House Visitor Center and a stone wall. The inscription "National Park for the Arts" is included. CT-12 depicts an artist working on a painting of the Burlingham House Visitor Center and a stone wall. CT-13 and CT-14 portray a portable easel holding a canvas with the artist’s painting of the scene overlaying the actual landscape at Weir Fam. This scene is of the area behind the main house and shows the studio. The canvas and easel are portrayed in greater detail than the rest of the design, underscoring the mission of the site: specifically to create a legacy of artistic expression. CT-15 features a log gate that lets people pass through fields, typical of the site. 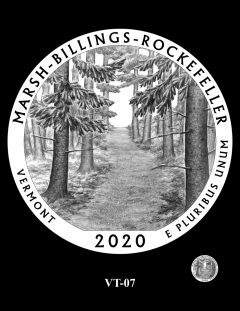 Stylized trees create an open space above a rolling landscape with natural granite outcrops and stone walls. A palette at the bottom of the composition depicts the inscription "National Park for the Arts." CT-16 displays a portable easel holding a blank canvas looking towards the entrance to the site. It shows the stone walls common in the area, a wild growth of day lilies, and an empty canvas (symbolic of the optimism and potential of art). CT-17 features a frame that encloses a landscape near the entrance to the site. It shows the stone walls common in the area and a wild growth of day lilies. The inscription "National Park for the Arts" is included. CT-18 features an "en plein air" painter applying pigment to a stretched canvas – a creative endeavor encouraged by the Park. The inscription "National Park for the Arts" is included. CCAC: Members requested design re-submissions for reconsideration. VI-01 depicts a red mangrove tree in an early stage of its life cycle, as it evolves from a very small plant to an adult tree. The design brings awareness to the park’s endangered mangrove forests and the unique and delicate nature of how the species reproduces in salt water. CCAC: The above design, VI-01, was recommended. VI-02 features a school of Blackbar soliderfish swimming past a shallow coral reef dominated by elkhorn coral. VI-03 depicts a conch shell resting on the beach close to one of the cultural landmarks in Salt River Bay Historical Site and Ecological Preserve, with red mangroves in the background. VI-04 portrays a juvenile Green Sea Turtle swimming among red mangroves on the shore of Salt River Bay. VI-07 highlights a Green Sea Turtle swimming through the mangrove roots as the viewer looks across the bay to see the mountainous landscape on the other side. VI-12 features a Green Sea Turtle basking in the Salt River Bay mangrove shallows. 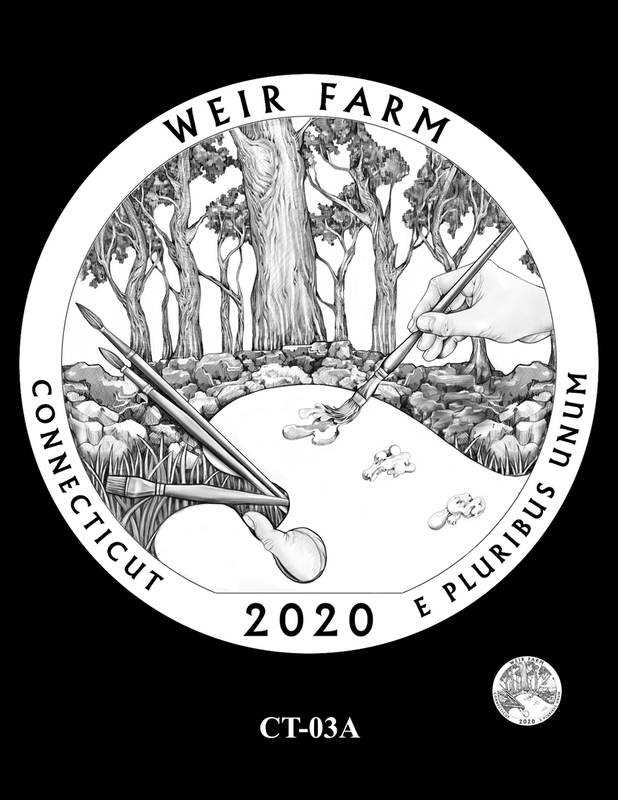 VT-01 and VT-01A depict the planting of a sugar maple sapling, representing the regeneration and conservation of the forests. In the background, design 01 includes the Marsh-Billings-Rockefeller Mansion on a hill, while design 01A portrays a grassy hillside with the Green Mountains. CCAC: The above design, VT-01A, was recommended. 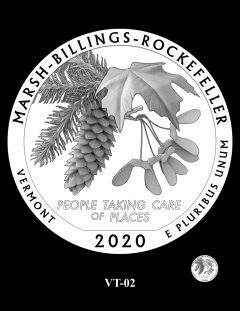 VT-02 features branches of a Norway spruce and a sugar maple with seeds, representing both the present and the hope for the future. The inscription "PEOPLE TAKING CARE OF PLACES" illustrates the commitment to conservation and stewardship demonstrated by the Marsh, Billings, and Rockefeller families. VT-03 depicts a sugar maple seedling passing from the hands of one generation to the next. This simple gesture is emblematic of the stewardship required to conserve our shared natural resources for the enjoyment of future generations. VT-04 features branches of a Norway spruce, with the seeds being released from the cones, symbolically continuing the ideas of George Marsh and Frederick Billings in conservation and sustainability. 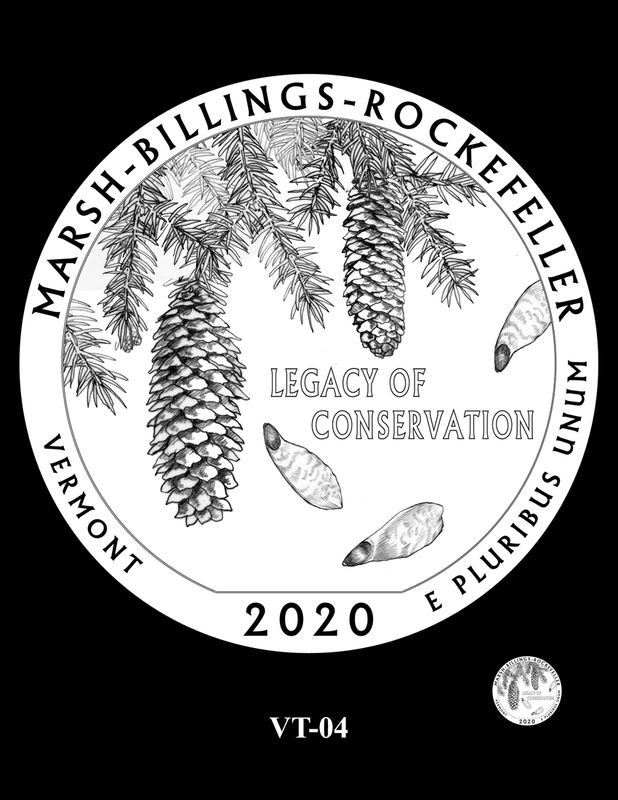 The inscription "LEGACY OF CONSERVATION" completes the design. 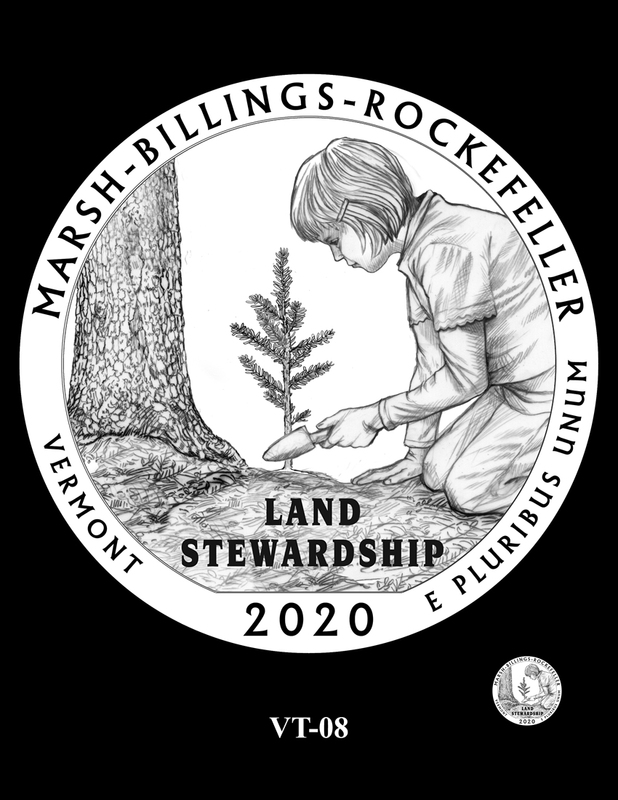 VT-05 illustrates the concept of conservation and the cycle of planting and harvesting. Here a Norway spruce seedling is shown against a backdrop of horse-logged spruce. 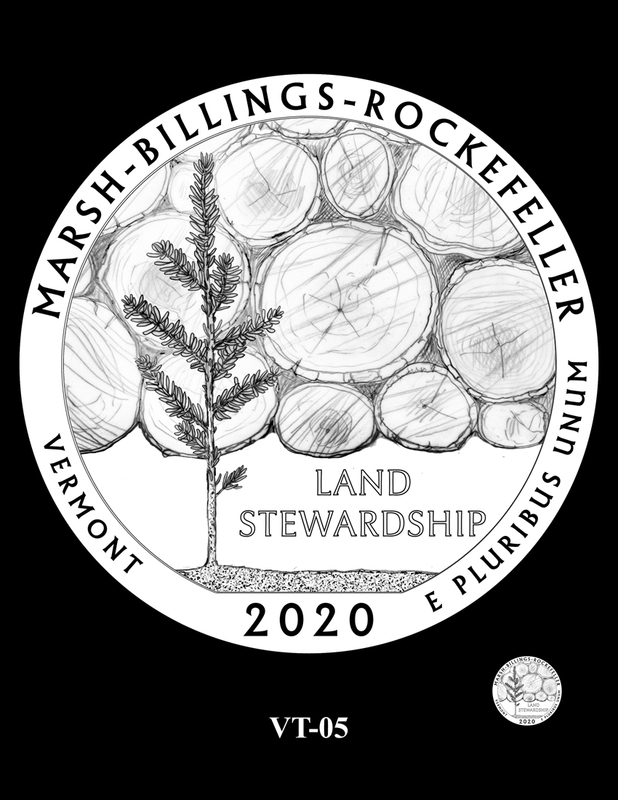 The inscription "LAND STEWARDSHIP" is included. 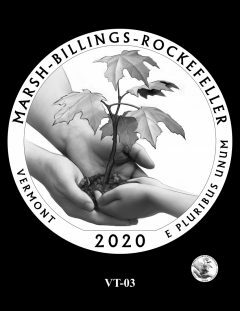 VT-06 recalls a few of the thousands of Norway spruce seedlings planted by Frederick Billings, following the inspiration of George Marsh. The planting was an effort to restore the deforested lands around the home that had resulted in erosion and the loss of topsoil. The inscription "FUTURE FOREST" is at the top of the design. 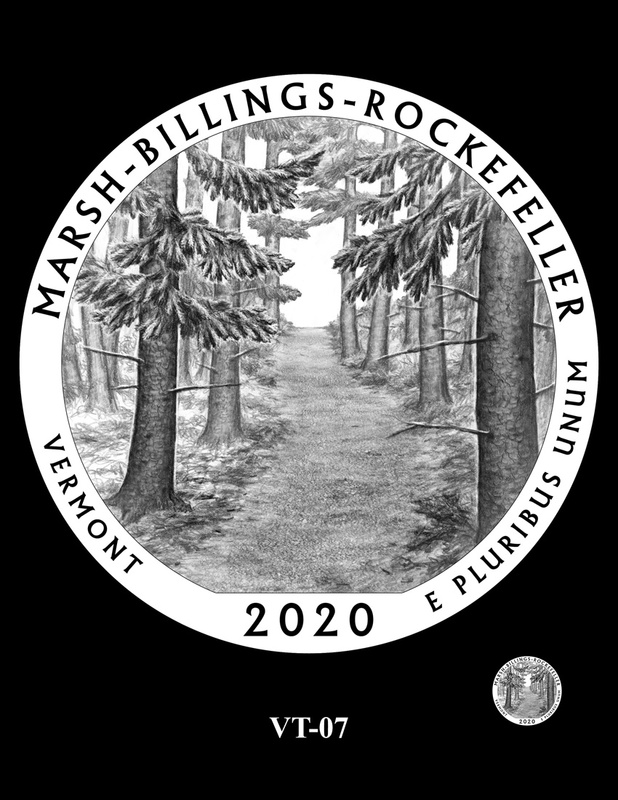 VT-07 portrays the carriage trails cutting through the planted Norway spruce forests at the park. It evokes the ideas of conservation, stewardship, and human access — inviting viewers to imagine themselves entering the forest and experiencing the feeling of being sheltered by the tall Norway spruce trees. 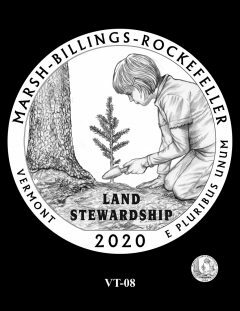 VT-08 depicts a young girl completing the planting of a Norway spruce seedling near an established tree, continuing the life cycle of the forest. 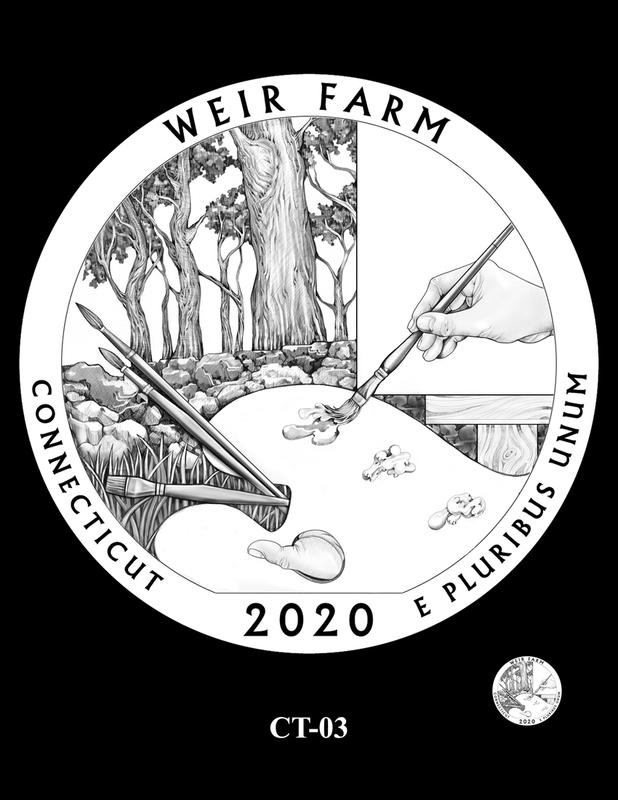 The child represents the conservationist, seeking to maintain a sustainable forest for future enjoyment and education. 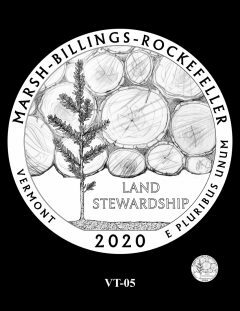 The inscription "LAND STEWARDSHIP" anchors the design. 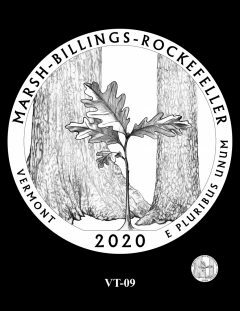 VT-09 feature a young oak seedling next to a maple and a Norway spruce. 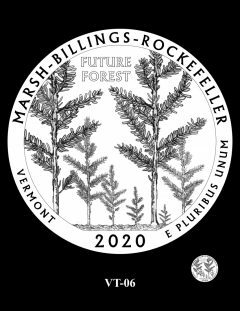 The seedlings are a part of the environment that ensures the continuing health of the forest, representing 150 years of environmental conservation and land stewardship throughout the park. 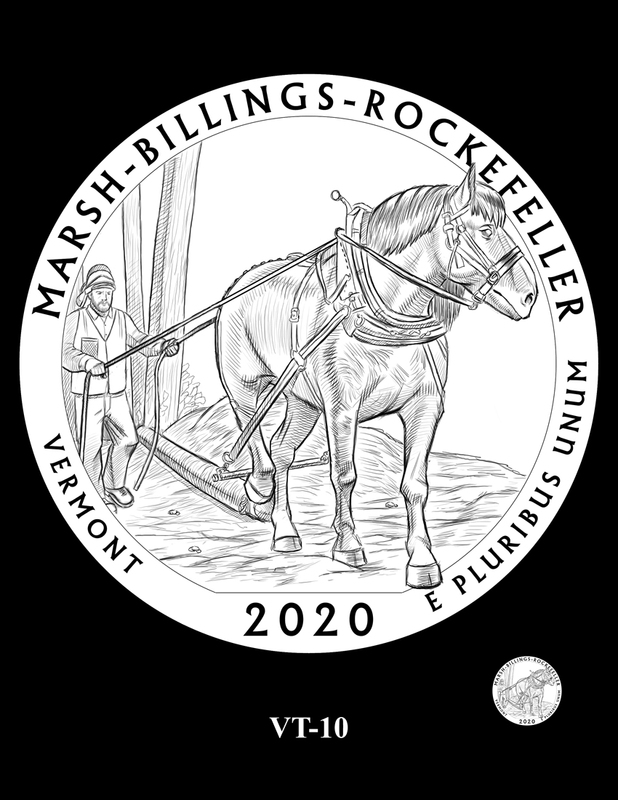 VT-10 depicts modern logging and forest management in autumn using a horse logging method, one of several methods of logging used within the park. KS-01 features a pair of Greater Prairie Chickens in the tall grass, where their habitat remains protected by the Preserve. KS-02 depicts a Greater Prairie Chicken hen and two of her chicks, emerging from a clump of Big Bluestem grass in spring. KS-03 features a male Greater Prairie Chicken in prairie grass, while a female flies overhead. KS-04 portrays a male Greater Prairie Chicken in its habitat. 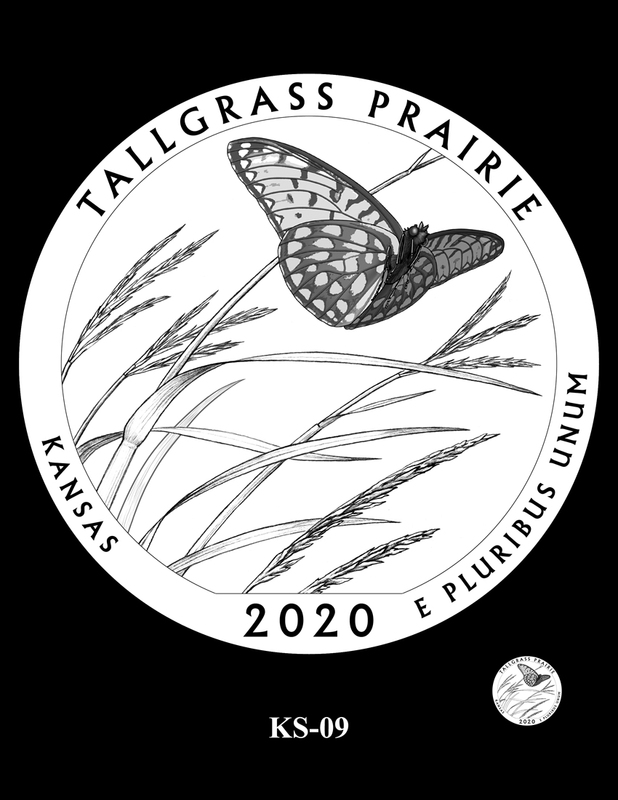 The tallgrass prairie is visible in the background. 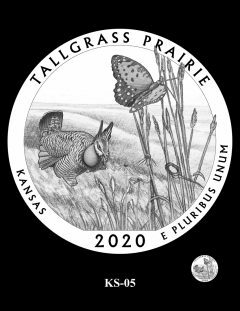 KS-05 depicts a male Greater Prairie Chicken nestled among the rolling hills of the tallgrass prairie with a Regal Fritillary butterfly perched on Indian grass. 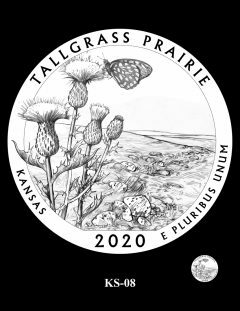 KS-06 showcases three of the many wildflower species that grow in the Preserve. 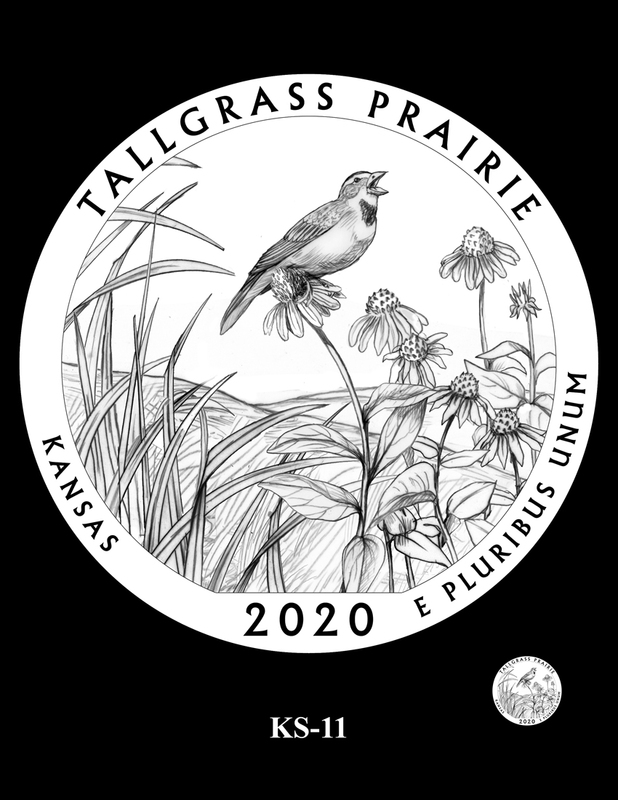 Featured (left to right) are Gaura, Compassplant, and Blazing Star, with the rolling hills of the Tallgrass Prairie in the background. KS-08 features a Regal Fritillary butterfly landing on a wavy-leaf thistle bloom. In the background is an outcrop of limestone found in the Preserve. KS-09 shows a skyward view of a Regal Fritillary butterfly against a backdrop of Big Bluestem and Indian grasses, iconic to Tallgrass Prairie. CCAC: The above design, KS-09, was recommended. KS-10 features Big Bluestem grass waving in the prairie winds. This species, which can grow to a height of six to eight feet with its root system growing just as deep underground, is largely responsible for the formation of the famous prairie sod. It gets its name because the stem turns blue or purple as it matures. 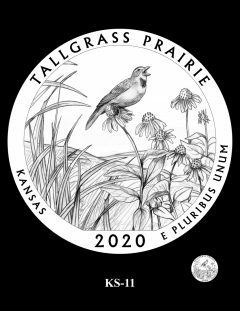 KS-11 depicts a Dickcissel songbird perched on a purple cone flower, one of over 300 species of wildflowers found on the tallgrass prairie. The sloping hills of the prairie are seen in the background. AL-01 depicts a Tuskegee Airman pilot suiting up to join the fight during World War II with the Moton Field control tower in the background. The pilot looks upward with pride and confidence as two P-51 Mustangs pass overhead. 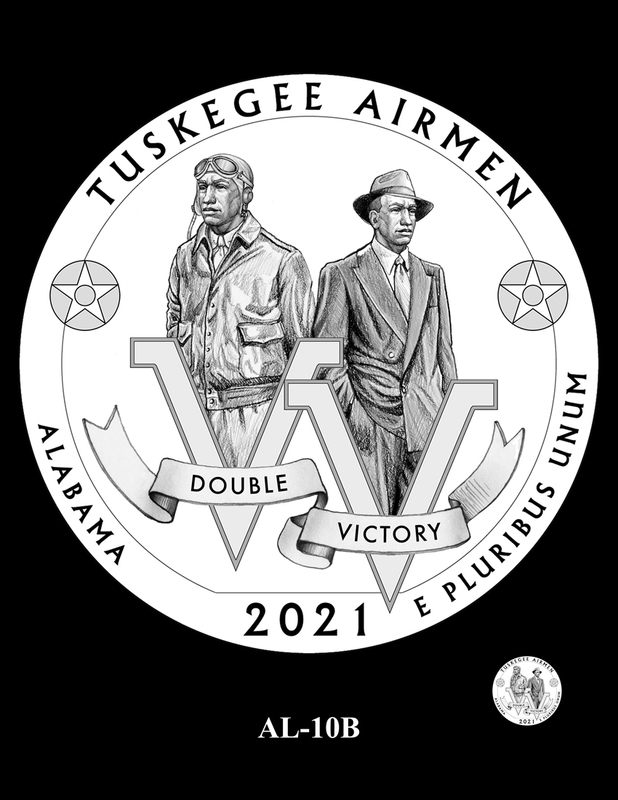 The inscription "THEY FOUGHT TWO WARS" is arced across the top as a reference to the dual battles the Tuskegee Airmen fought – fascism abroad and racial discrimination at home. CCAC: The above design, AL-01, was recommended. 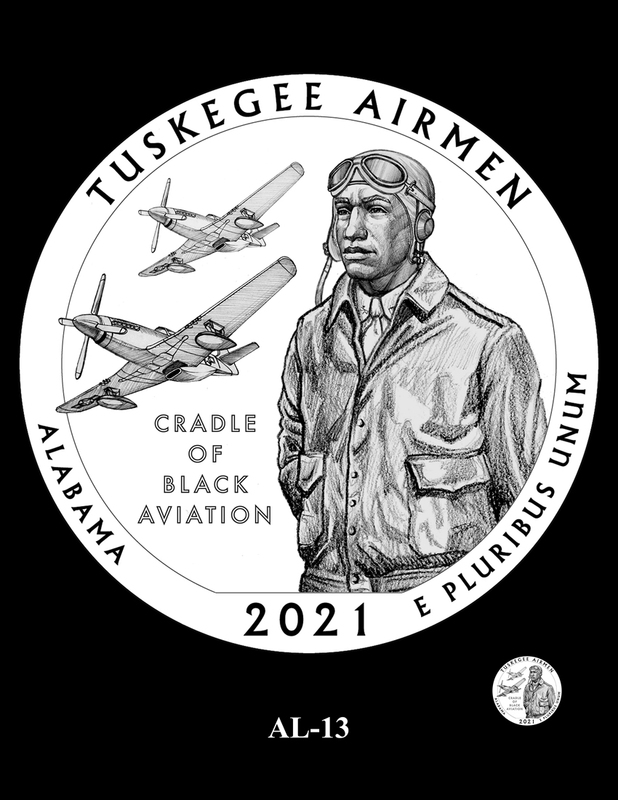 AL-02 features a Tuskegee Airman suiting up on the tarmac with his P-51 Mustang in the background. He looks upward with pride and confidence, ready to join the fight during World War II. The double V and the inscription "DOUBLE VICTORY" recall the struggles the Tuskegee Airmen faced both at home and abroad. AL-04 portrays a PT-17 Stearman, an aircraft used by The Tuskegee Institute to train pilots. 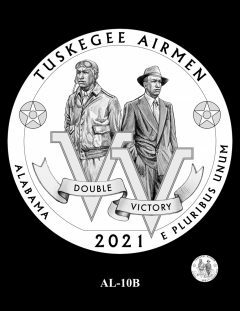 The background contains the symbolic double V. Five stars represent the five graduates from the very first class of Tuskegee Airmen. AL-06 depicts a P-51 Mustang with a symbolic double V in the background, representing the Airmen’s fight to defeat both fascism abroad and racism at home. The inscription "THEY FOUGHT TWO WARS" is arced across the top. AL-08 and AL-09 portray P-51 Mustangs, the primary battle aircraft used by the Tuskegee Airmen, flying overhead. The planes are interlaced with a symbolic double V. Inscriptions included are "AT HOME AND ABROAD" and "DOUBLE VICTORY." TWO WARS" is arced across the top. AL-10A, B, and D – all feature two representations of the same man: as an aviator fighting fascism during the war, and as a civilian fighting against racial discrimination. Design A features two aircraft primarily used by the Tuskegee Airmen – the PT-17 Stearman for training (seen on the right), and the P-51 Mustang for battles (on the left). A banner with the inscription "DOUBLE VICTORY" is seen at the bottom. Design B depicts a symbolic double V. The artist purposely pierced the border with the second V before the inscription "E PLURIBUS UNUM, or, "Out of Many, One," to further emphasize the struggle against racism. Roundels from the P-51 Mustang balance out the design. Design D features larger figures and includes the inscriptions "VICTORY IN WAR" and "VICTORY AT HOME." AL-12 depicts Pilot, Navigator, and Bombardier wings representing some of the many specialties achieved by Tuskegee Airmen. They are superimposed over the familiar double V design. Borrowing from heraldry, the left side of the field utilizes vertical stripes to indicate the color red, representing warriors and military strength. The right panel of horizontal lines indicates the color blue, representing truth and loyalty. Together with the center panel, depicting white by the smooth texture, they represent the American flag. 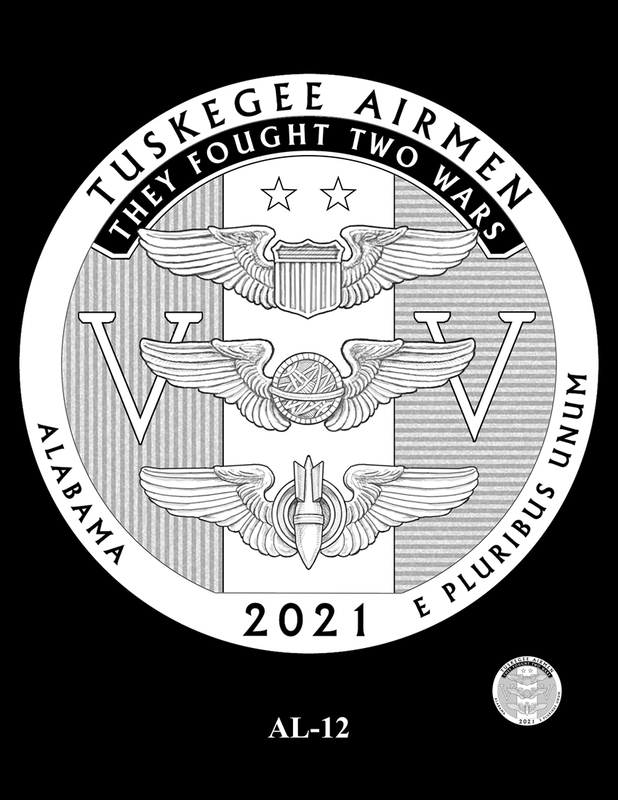 The inscription "THEY FOUGHT TWO WARS" is centered across the top of the design. AL-13 depicts a Tuskegee Airmen suited up for flight with two P-51 Mustangs flying in the background. The inscription "CRADLE OF BLACK AVIATION" completes the design. 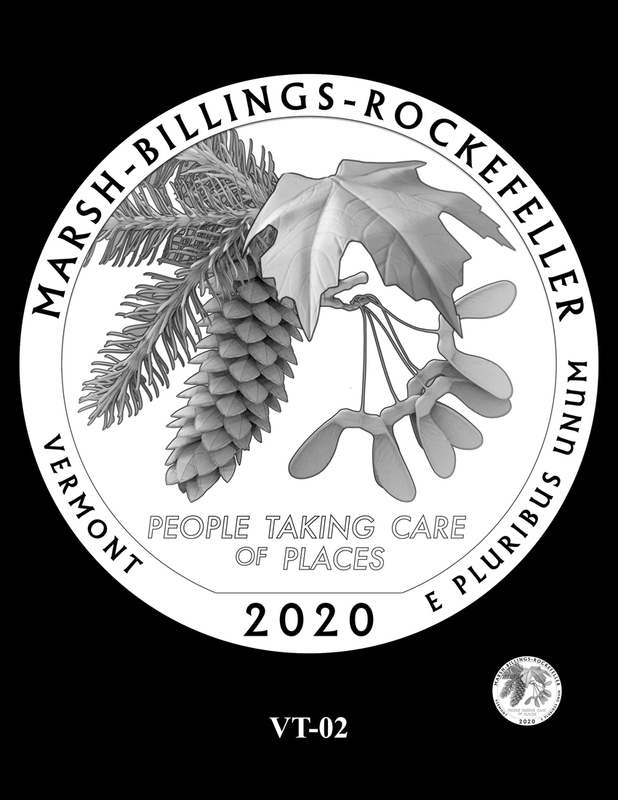 I do not like war so I do not buy war coins. You said it! They should have stopped it after the state quarters. Enough is enough already! Amen! I actually like AS-03 better. 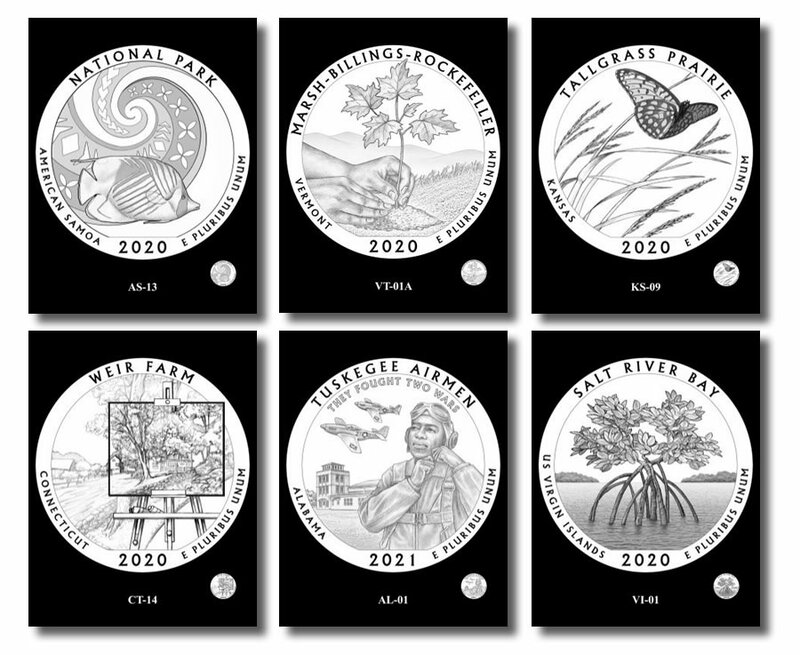 I love every ATB 5 oz coin from 2010 thru 2021 cant wait for the 2019 set to come out. 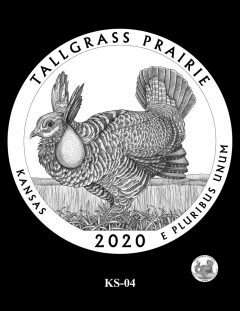 i want every coin in the SP70 , the MS69 or the plain bullion set. they are big ! they are bold! some collectors dont want to store the large coins that is OK !…leaves more for me. lol Passion draws us to collect & in time Luck will allow us to profit monitarily from the collection & if not i will be blessed to adore them the rest of my life and my grandkids can fight over “shall we Keep them or sell them”? 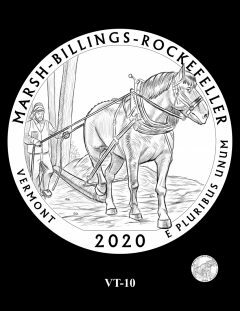 I am a very proud owner of the only 3″ 5oz state coin set the US Mint ever produced. We cant take it with us I am just the very happy caretaker for a season.